Maybe it’s because I move in pretty nerdy circles, but an awfully large number of people have been talking about the new Paper iPad app from 53, the team behind Microsoft’s mothballed slate “Courier” (do yourself a favour and watch the Courier demos on YouTube). 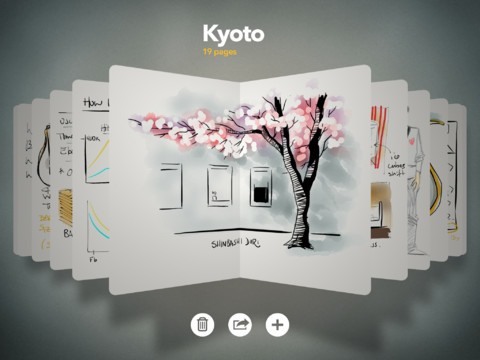 I’m a weary cynic (a natural by-product of staring at over-hyped gadgets all day) but even my tired soul was intrigued by the suave note-taking app as presented by the company’s super-slick demo video. If you haven’t seen it, a guy wanders the city streets, iPad in hand and simply *creates*, stopping wherever the fancy took him and jotting down inspiration. As iPads become more prevalent, the desire to elevate them from expensive toy to production power house is growing, and apps like Paper have their feet firmly in the “take me seriously” camp. Paper at its simplest, is very much like it’s namesake, a blank sheet (at the same time one of the most daunting and the most exciting things you can be faced with). This stripped down approach is supposed to allow you to simply throw down ideas, before features and UI elements get in your way and slow you down or distract you. However simplicity has it’s drawbacks. I was forever clumsily invoking the menu bar when I didn’t want to (a simple swipe up) and failing to when I didn’t. And more than once I found myself missing out on resizable brushes, layers and zoom. There is an undo button (as well as an eraser) but the rewind gesture – a cute two-fingered swirl – could be a little hit and miss and quite hard to finesse. Now that I have minor quibbles out of the way I have to join the chorus of app reviews saying that paper is simply delightful. It’s fast and easy to use, and aforementioned gripes aside, incredibly intuitive. It’s also beautifully presented. All your notes are collected into carefully presented moleskins and there is eye candy galore, with every page turn or crumple painstakingly animated. This is especially apparent on the new iPad’s retina screen, which is crisp to the point where it’s perfectly possible for the tablet to abstract itself into the background and the canvas to come first and foremost, which is quite an achievement. 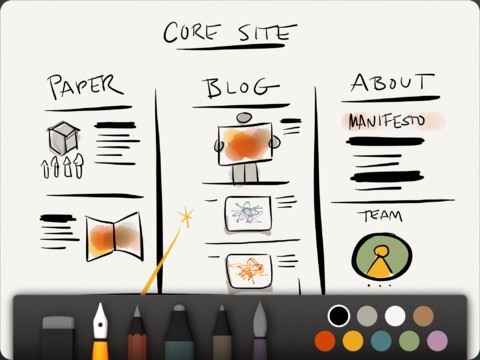 FiftyThree plumped for a freemium model so for free you will get one pen, one eraser and a whole lot of notebooks. If you want to expand your toolbox to include a pencil, sketching pen, marker, and water colours you can buy an add-on bundle for $8 or you can make pen-by-pen purchases for $2 each. For those of you who want to really get creative, try using a stylus for drawing. There are a variety of touchscreen sensitive styli available for the iPad. A few of the best ones are the new COSMONAUT stylus from Studio Neat, the Pogo Sketch from Ten One design, and the Styra from BoxWave. Note: If you have not already done so, be sure to also check out the Penultimate app on your iPad. 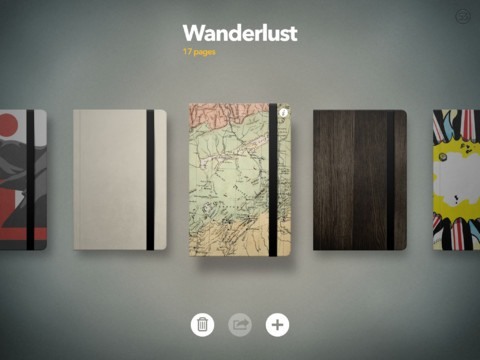 AppSafari review of Paper by FiftyThree was written by Shem Pennant on April 3rd, 2012 and categorized under App Store, Art, Featured, iPad apps, Notes, Productivity. Page viewed 5244 times, 1 so far today. Need help on using these apps? Please read the Help Page.